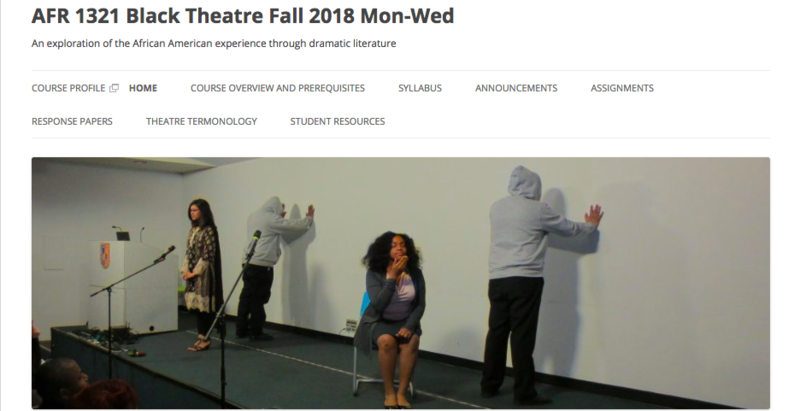 This week we’re spotlighting Professor Foster-McKelvia’s AFR 1321 Black Theatre course, an introduction to African American dramatic literature that “explores the complex ways in which the black experience is constructed and presented by playwrights”, and offers one entry point for understanding the African American experience more broadly. Exploring this course site would be of interest to faculty looking for examples of how to organize course sites, as well as for students who may be interested in taking this course in the future. For students, the clean structure of the site is helpful in knowing what you can expect of the course, and what the expectations, requirements, and opportunities of the course are. For starters, read through the course overview and prerequisites, download a pdf of the syllabus, and review the response papers. For faculty, the organization of the content on the site offers useful insights for thinking about how to use the OpenLab to support your coursework. Professor Foster-McKelvia strategically uses a mix of static pages and categorized posts to organize content in an easy-to-navigate way. Static pages like the Course Overview and Prerequisites, Syllabus, Theatre Termonology and Student Resources are pages specifically created by Professor Foster-McKelvia and contain content that she wants to communicate to students that for the most part will not change over the course of the semester. In contrast, Announcements, Assignments, and Response Papers rely on “category archives”. Category archives collate all POSTS (not pages) which have been given a specific category (announcements, assignments and response papers, for example) and renders them in reverse chronological order on the screen. This means that the most recent posts (ex. announcements made today) are at the top, while older posts (ex. announcements made last week) are pushed down further in the feed. As Professor Foster-McKelvia has done, category archives can be inserted into the main menu so they are easily accessible to visitors of the course site. Posts, whether categorized or not, are great for dynamic content, or content that changes or may be updated over the course of the semester. Furthermore, posts can be created and published by students so, like Professor Foster-McKelvia, they can be used to submit assignments, engage in course discussions or ask questions. Curious about how you can use these techniques in creating your course site? Join us for our Open Hour next THURSDAY (12/6) and ask our Community Team members! Sign up here!